Clarke began his music career playing bass in the 1960s with a variety of local bands including The Kegmen, The Locomotive and St. James Infirmary. By 1970 he’d joined the renowned Colosseum until the band split in 1971. He briefly joined Uriah Heep for the ‘Demons And Wizards’ album in 1972. 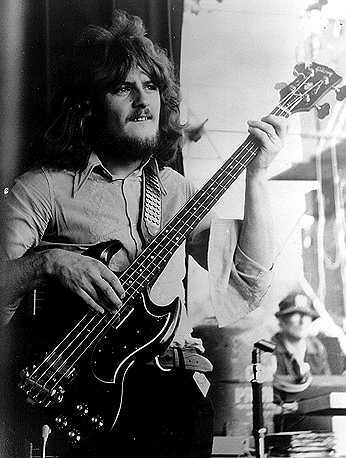 In the beginning of 1973 he joined Jon Hiseman’s ‘Tempest’and played bass on the two Tempest studio albums with Allan Holdsworth, Ollie Halsall and Paul Williams, and a live album issued later. He also played bass on Ken Hensley’s solo albums. In 1975 he went on to join Natural Gas. Blackmore had attempted to rehire bassist Jimmy Bain for the ‘Long Live Rock ‘n’ Roll’ sessions, Bain turned him down. Mark Clarke was hired but after a few sessions, Blackmore decided he didn’t like Clarke’s playing, wiped his bass lines from the tapes and re-recorded some songs himself. Bob Daisley was eventually hired to complete the album and joined the band full time. Daisley ended up receiving the bass player’s credit on the album. Clarke continued working with various artists, including in 1980, Billy Squier. In 1985 he joined The Monkeesand until recently was still working with Davy Jones. Clarke has also worked with Mountain, Ian Hunter and Torque. In 2010 Mark Clarke released his first solo album ‘Moving To The Moon’.